Caltex and CGR Team up in new Sports Initiative | Welcome to Chevron Lubricant Lanka PLC. February 26, 2008 : Caltex, a leader in lubricants and marketed by Chevron Lubricants Lanka PLC has come forward to sponsor the Ceylon Government Railways (CGR) volleyball team for 2008. 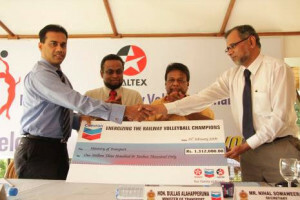 Entering into this new agreement with the Ministry of Transport, Chevron Lubricants Lanka PLC will sponsor both the men and women’s volleyball teams of the Sri Lanka Railways. The members of the CGR Volleyball team have performed outstandingly in their individual capacity both at a national and international level. Their achievements range from representing Sri Lanka in the Junior National Team, to their participating in the SAAF games in 2006 and the Commonwealth Games in 2007. Amongst the squad 7 represent Sri Lanka in the women’s national team while 5 are representatives of the men’s national team. Additionally, 2 female members of the team have performed exceptionally in beach volleyball with numerous accolades and awards to their name.